Mornings are still dark at this time of the year. They will get darker yet as we move towards December. It is easy for me to idle my time away surfing the Internet. I’ve had my quota. It is time to move on. So I am here, to breathe and meditate and to flex my fingers. It is a good exercise to ease into the day. My fur baby is at my side as usual. Times are changing for both of us. We are not so young and limber anymore. We seldom go down to the river to run/walk on its frozen waters and to converse with God. It seldom freezes over now even in the heart of winter. Now we take our walks and conversations on our urban streets. I can still feel His presence amid the traffic and noise. I can hear our collective breaths in the air. What is in one is in the whole. We are all connected. It is a grey Monday. I’m sitting with my decaf. I’m not motivated or inspired. If anything, I’m sleepy. If I haven’t been programmed to do and create, I would lay down and have a nap. I might just do that yet. I’ve been training myself not to ‘do’ lately. I’m cutting back time spent scrolling and crawling through cyberspace. I’m grabbing back some empty time for my soul and sanity. I’ve forgotten that I am the captain of my ship. I make the calls which direction I’m heading. I was not good at napping. I stretched out on my Lazy Boy with my quilt and closed my eyes. My sleepiness disappeared. I was left with trying to will myself to sleep. It was no good. I need more practice. I have to ease into it. 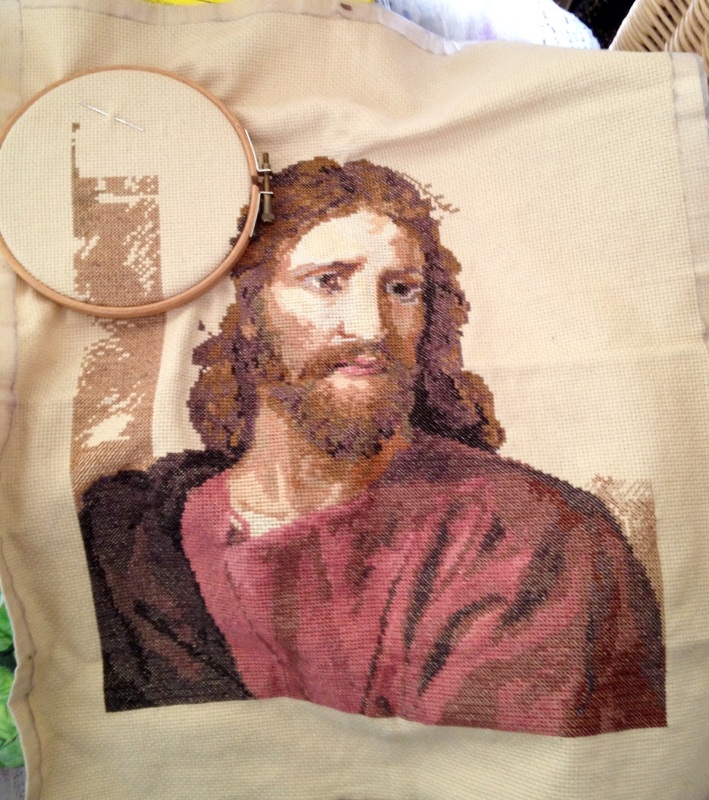 I had to give it up and worked on my cross stitch of Jesus. It was relaxing, an emptying of mind and stress. I’ve filled most those blanks on that section of background. It’s like doing a crossword puzzle only much easier. I knew all the answers. If only I knew all the answers to life, wouldn’t it be grand? It is getting darker. It’s after 5. Sheba and I have been around a block or two and maybe even more. I tried not to think it’s cold. I tried not to shiver. I tried to think warm and not to cut short our usual walk. I walked tall and as briskly as Sheba would go. She likes to dawdle and stick her nose into the snow, looking for a snack. But we are back. I’m here with my tea, toast and jam. I’m good at that. This entry was posted in Uncategorized and tagged cross stitch, empty times, filling in the blanks, Jesus, life, naps, toast and jam, walks, writing. Bookmark the permalink.